PAHOA, Hawaii — A new fissure emitting steam and lava spatter spurred Hawaii officials to call for more evacuations on Sunday as residents braced for an expected eruption from the Kilauea volcano. The Hawaii County Civil Defense issued an alert that an 18th fissure was discovered along a road west of a major highway on the Big Island. Residents on that road were being told to evacuate, and two nearby community centers were serving as shelters for people and pets. Popping, exploding and sloshing sounds could be heard from the fissure as far as 1,500 yards (1,400 meters) away. The fissures, ground deformation and abundant volcanic gases indicate eruptions on the eastern flank of Kilauea are likely to continue. The latest opening came the morning after two other fissures opened on Saturday. Most of the lava outbreaks have occurred in and around the Leilani Estates neighborhood, where molten rock has burst through the ground, destroying more than two dozen homes and resulting in evacuation orders for nearly 2,000 people. The U.S. Geological Survey reported that the 17th fissure, which opened Saturday night, was spattering but no flow had formed. The 16th fissure had spilled lava into an open field earlier in the day. 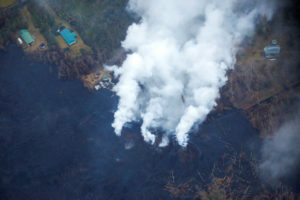 The Hawaiian Volcano Observatory reported the fissures opened just east of the Puna Geothermal Venture energy conversion plant, where steam and hot liquid are brought up through underground wells and the steam feeds a turbine generator to produce electricity. Plant workers last week as a precaution removed 50,000 gallons of a flammable gas stored at the site. Geologists warn that Kilauea’s summit could have an explosive steam eruption that would hurl rocks and ash miles into the sky.